I, Erica from Erica's Aesthetics, sold my salon to La Bella Medispa in October 2017. Due to high demand, I however continue to fly back to visit my existing and new cosmetic tattoo and eyelash extension clients for a few days at a time, every 5 to 6 weeks from the same premises as before (45 Jardine Street in Kingston). ​For cosmetic tattoo and eyelash extension bookings please call Erica on 0478 144 819 or book online by clicking the button below. More visits for 2019 will be updated soon. For all other beauty treatment bookings, please call (02) 6162 4199. The lovely and highly skilled staff at La Bella Medispa will look after you. At Erica's Cosmetic tattoo in Kingston, Canberra, all Cosmetic Tattoo treatments are carried out by Erica, a registered member of the Australian Cosmetic Tattoo Association. Erica has many years of experience in the field and she uses the advanced Golden Eye Micro-pigmentation method. This internationally recognised method uses very fine and exact drawing techniques providing exceptionally natural results. 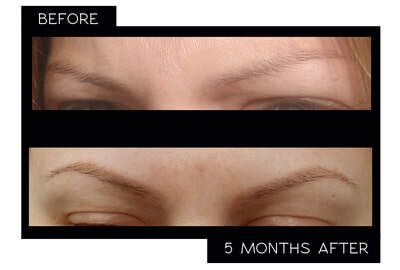 As an example, eyebrows are created by drawing each hair individually (feathering technique) instead of creating two solids; the result is subtle and natural, even with no make-up applied. 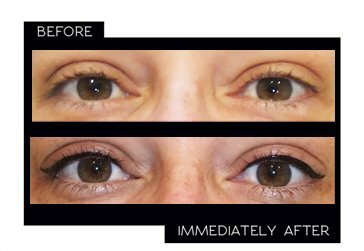 Cosmetic Tattoo is perfect for those requiring their features enhanced, those who suffer from poor eye sight or shaky hands, cosmetic allergies or those who can not wear makeup due to their work or hobbies. It suits anyone who always wants to look their best with little or no effort. 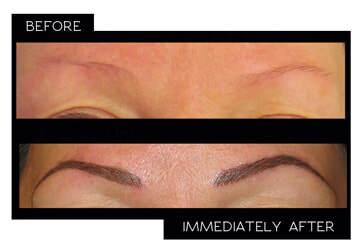 Cosmetic Tattoo can semi permanently enhance lip lines, eye lines or the eyebrows. Cosmetic Tattoo is a semi permanent procedure to enhance facial features. Pigment is applied using a small sterile needle to distribute colour under the surface of the skin. Erica's Aesthetics only uses proven safe and high quality pigments. The length of time the results will last, is contingent on many factors including skin type. Oily skin has a rapid metabolic and cell turn over rate, and usually causes the result to fade faster than comparable drier skin. 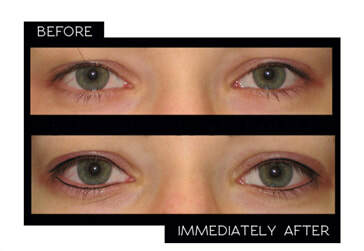 On average the results last for approximately 1.5 years (fair eyebrows) to 6 years (black eyeliner). In preparation for enhancing the lips and eyebrows, Erica draws a sketch on the area to ensure suitable and desired colour and shape. It is not necessary to remove any existing eyebrow hair before this point. The procedure takes about 1-2 hours depending on size and depth of colour of the treated area. Immediately after the procedure, the skin is usually slightly swollen, and the result is darker than the final result. It takes up to one week for the colour to settle and during that time it will slightly lighten. The desired result is usually achieved within 2 applications (included in cost). The follow up applications should be applied 5 to 6 weeks after the initial application. Cosmetic Tattoo is a safe but not a fully painless process, however a topical anaesthetic is used throughout the entire procedure. After the procedure, the treated area may be slightly swollen for up to one to three days, depending on the skin type. Below are some examples of cosmetic tattooing carried out by Erica. ​After the treatment make-up application to the treated area must be avoided for three days. It is also good idea to have a weeks break from swimming, steaming the face, tough exercise, solarium use and sun bathing. It is also strictly forbidden to scratch and touch the treated area with your fingers. It is very important to keep the pigmented area moisturised at all times during the first week post application. 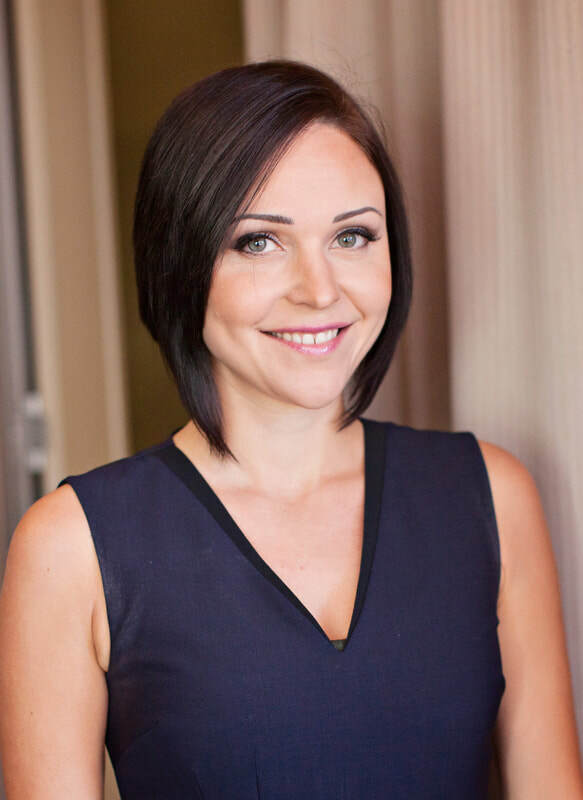 Erica is a qualified CIDESCO (Internationally recognised) beauty therapist, certified in the advanced Goldeneye micro-pigmentation method with over 10 years of experience in this field. Erica is a member of the Australian Cosmetic Tattoo Association, and enjoys learning the latest techniques the industry has to offer, and keeping her knowledge current.